The jackalope of the North American Midwest is said to be half-jackrabbit and half-antelope; in appearance, it is a large rabbit with antlers. Said to be smart as a person and able to imitate human voices, these strangely magical creatures are fantastically difficult to catch. Many stories are told of hunters that were led astray by hearing calls of “he went that way!”, only to discover later these were yelled by the jackalope itself, now long gone. But don’t get the idea that jackalopes dislike humans; they’re just very cautious around people. Other stories assert that jackalopes sometimes sang along with the cowboys of the old American West when they were camping out by their fires, though the animal itself always stayed well out of sight and reach of the men. Some call jackalopes the “warrior rabbit,” asserting that when cornered they will use their antlers to attack; and it is also said that jackalopes have razor sharp teeth and fangs, and that they are far stronger than their body size would normally indicate. More remarkable still, it is said that this petite monster can run at speeds of up to 90 miles per hour; that’s faster than a cheetah! Douglas, Wyoming, in the United States is self-declared as the “Jackalope Capital of America.” According to local legend, it is the first place a jackalope was ever spotted, in 1829. On the second Friday and Saturday of every June, the town has a festival called “Jackalope Days” during which jackalope hunting licenses can be obtained from the Douglas Chamber of Commerce. But you’ll still have to be lucky to catch a jackalope; the license is only good between midnight and two AM on June 31st! A man named Douglas Herrick is credited with creating the first stuffed “jackalope” in the 1930’s while living in Douglas, Wyoming (yep, the very same “Jackalope Capital of America”). Herrick, with his brother Ralph, combined rabbits they had caught with antlers they had lying around. These stuffed animal fakes proved very popular, and soon the brothers’ “jackalopes” could be seen in bars and homes across the United States. Because of this history of fakes, it is now commonly assumed that jackalopes have never been real; just fun make-believe based on Herrick’s humorous creations. But there are in fact rabbits with horns, and they have actually been seen and caught since the 16th century! European books on animals from 1534 CE to the mid-1800’s include listings and illustrations of horned rabbits. In the United States, people were discussing ― and catching ― horned rabbits since at least 1891, and in at least four different states: Texas, Oklahoma, Kansas, and Nebraska. It is now believed that all of these “horned rabbits” suffered from a disease: Shope papilloma virus. Shope papilloma virus causes rabbits to grow warts that can be easily mistaken for horns; but these growths are only on the surface of the rabbits’ skin, unlike true horns that sprout from an animal’s bones. The horn-like growths caused by this disease usually grow on a rabbit’s head and limbs, making it look more like a monster than a jackalope does. Given their strange appearance, it was common for the heads of these monstrous bunnies’ to be stuffed as proof of their existence. It was also common for sporting magazines to run short articles on them. So it's possible that Herrick’s original jackalope head was inspired as a parody of the other “horned rabbits” that were already often displayed! "A Peculiar Disease of Birds' feet observed in Central Nebraska," by Erwin H. Barbour, article in the Annual Report: Nebraska State Board of Agriculture for the Year 1900, 1901 State Journal Company, Nebraska, USA. Pg. 253-255. Online: Click here! "A Rabbit with Horns," article in Popular Science News, Vol. XXXII, No. 12, December 1898. Pg. 278. "Douglas Herrick," by Christopher Flynn, article in the Home of Everything Jacklope website, 2003 website. Online: Click here! "Enter the War Bunny," by John O'Sullivan, article in Forest and Stream magazine, Vol. LXXXVII, No. 4, April 1917. pg. 162. Home of Everything Jackalope, 2008 web site. Online: Click here! 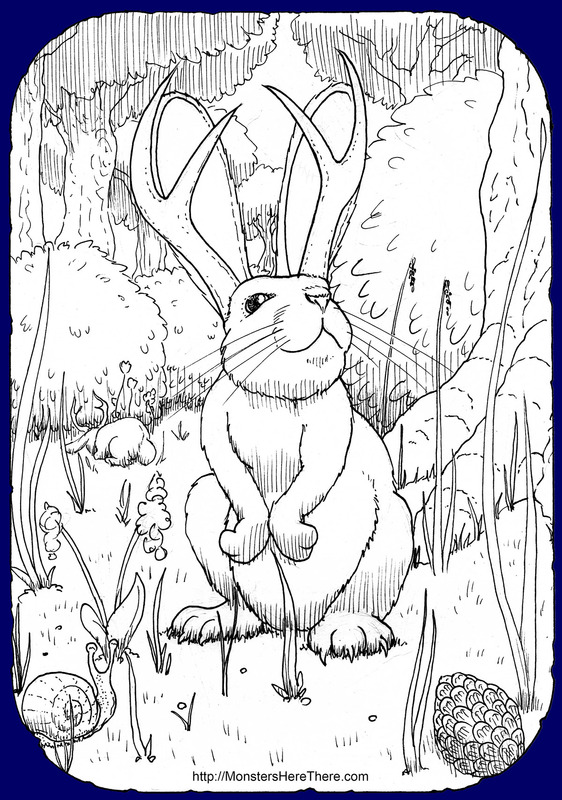 "Jackalope Fans, Take Note: Your mythical beast really does exist," by Chuck Holliday, 2010 website. Online: Click here! The Journal of the Cincinnati Society of Natural History, Volume XIV, No. 2, July 1891. pg. 76. Museum of Hoaxes: The Jackalope, 2008 website. Online: Click here! "The Origin of the Jackalope," article in the Douglas Chamber of Commerce website, 2008 website. Online: Click here! "Regarding Horned Rabbits," by R.L. Glass, letter to Popular Science News, Vol. XXXIII, No. 3, March 1899. Pg. 62. "The Shope Papilloma-Carcinoma Complex of Rabbits," by John W. Kreider and Gerald L. Bartlett, article in Advances in Cancer Research, Vol. 35, 1981 Academic Press, Inc., New York, New York, USA, ISBN: 0-12-006635-1. Pg. 82. Online: Click here! “Where ‘War Bunnies’ Thrive,” a collection of letters in Forest and Stream, June 1917, New York, New York, USA. Pg. 261. Online: Click here!